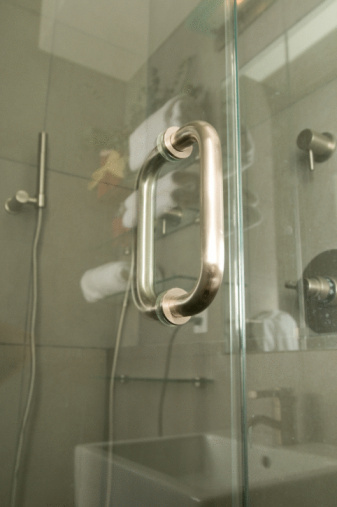 Swinging shower doors are held in place using a magnet set in the latch of the door. When the door closes, the magnet adheres to the metal surface of the shower frame and keeps the door closed. If your shower door is swinging open, it might be time to replace the magnet inside of the latch. This is a very simple repair, requiring few tools and a minimal home repair skill set. In fact, the repair can be completed in just a few minutes. Replacing a magnetic strip for a shower door is a simple fix. Unscrew the latch. The screw is located on the interior of the door, directly on the latch itself. Remove the latch from the door, exposing the magnetic strip. Peel off the magnetic strip from the door with your hands. Fit the strip to the door. Place a new magnetic strip on top of the old magnetic strip. Cut the new strip to the same length as the old strip using either scissors or a utility knife. Shauna Zamarripa loves real estate and shares her expertise in her writing. She is a graduate of Almeda College with a B.A. in marketing. As a certified distressed property expert, Zamarripa's specialty is foreclosures and short sales. She writes for various online publications and also runs her own blogs on Homegain and Truila.